THE LUXURY CLASS, STATE OF THE ART COMPRESSION SOCK. 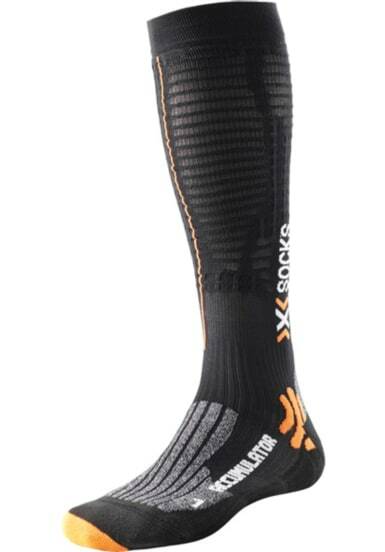 The X-BIONIC® Partial Kompression was developed especially for long-distance endeavors. You'll feel it immediately: The compression stabilises your muscles and optimises the transport of nutrients. Plus the pressure is only distributed horizontally across the knit ridges as to still use your skin as the cooling surface. Above and below, the skin's function remains unimpaired. Combined with the AirConditioning Channel®, numerous cushioning zones, and the anatomically designed footbed, the Accumulator Run helps you achieve your best performance. Also practical: With the PositioningLines an athlete can adjust the zones for a personal fit.